To highlight the value of their hot dogs in response to Burger King's recent launch of Grilled Dogs. 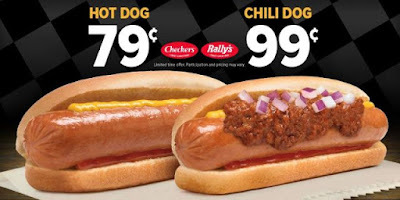 Checkers and Rally's are discounting their Grilled Hot Dogs to 79 cents each for a limited time (compared to $1.99 for Burger King's Classic Grilled Dog). Additionally, they're offering Chili Dogs for 99 cents each. The regular prices for the regular hot dog and Chili Dog are about $1 and $1.50, respectively. Like Burger King, Checkers and Rally's hot dogs are all-beef and grilled. Their standard Grilled Hot Dog comes with mustard and ketchup (Burger King adds relish and chopped onions), while the Chili Dog comes topped with chili, chopped onions, ketchup, and mustard (they also offer a Chili Cheese Dog but it's not included in the deal).